The best African teams go through a rigorous campaign to qualify for the Africa Cup of Nations, only to face an even tougher assembly of teams in the official tournament. The winning team must endure potential upsets and beat defending champions to obtain continental bragging rights. And what better way to display one’s glory than to proudly lift a trophy! With AFCON having been host to three different trophies throughout the years, we revisit the stories behind these trophies of the past, and present. The original trophy, made of silver, was named after the first CAF president, Egyptian Abdelaziz Abdallah Salem. Ghana became the first team to keep this trophy indefinitely after becoming the first winners of three Nations Cups in 1978. The Ghanaian football team, holding the Abdelaziz Abdallah Salem Trophy, in 1965. Named the Trophy of African Unity or the African Unity Cup, AFCON’s second trophy was given by the Supreme Council for Sports in Africa to the CAF prior to the 1980 tournament. This trophy’s design included a cylindrical piece with the Olympic rings, laid over an engraved map of the continent. It sat on a squared base and had futuristic triangular handles. Awarded from 1980 to 2000, it was permanently placed in the hands of the Cameroonian National Team that hoisted the trophy for the third time in 2000. 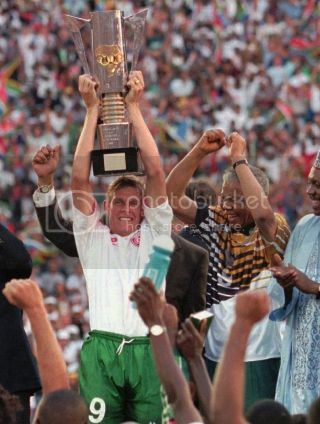 The Trophy of African Unity being lifted by South African captain Neil Tovey after it was presented to him by the late President Nelson Mandela in 1996. In 2001, the third trophy was revealed, a gold-plated cup designed and made in Italy by the same company that created the many trophies for FIFA World Championships. Egypt was the victor this time; winning the gold-plated cup indefinitely after they became three-time champions in 2010, in an unprecedented achievement by winning their titles consecutively! Unlike previous winners, Egypt was awarded a full size replica of the trophy for their efforts, with CAF deciding to permanently keep the Cup of Nations as a staple of the tournament. 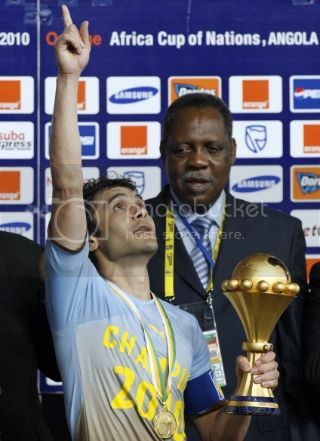 Egypt’s captain Ahmed Hassan, center, looks up as he holds the trophy flanked by CAF president Issa Hayatou.